Melbourne Square offers its residents every inner-city convenience, both within its own amenity-rich podiums and in the surrounding neighbourhood of Southbank and the CBD. A morning massage watching the city come alive. An evening swim overlooking the setting sun by the bay. A business meeting or private dinner with friends. Daily life at Melbourne Square means enjoying the city’s most exclusive mix-integrated development featuring residential apartments, retail and hotel as well as offices in the future – all within a walking distance to the CBD and CROWN. 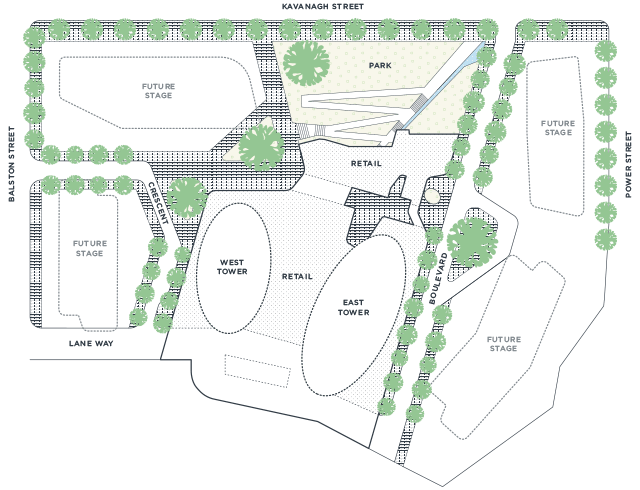 The Melbourne Square landscape offers experience at every scale from 3,700 sqm public garden to tree-lined boulevard walkways. Inspired by the urban gardens, promenades and piazzas of Europe, the Melbourne Square park features grassy lawns, pedestrian walkways and cascading steps of gentle serene waters. Copyright © 2018 OSK Property Holdings Berhad. All Rights Reserved. ConversionPage™ by Gapture® Malaysia. The 5-acre masterplan captures the very best of Melbourne. It has been designed as a natural extension of the city's network of landscaped spaces, retail strips and pedestrian walkways. It is set to be both a new neighbourhood environment within itself, a significant landmark in the integrated part of Southbank. Wide open piazzas and lush green expanses of lawn provide a place for people to gather and relax in an urban forest, while a wide range of retail, dining and community spaces deliver the city’s newest lifestyle destination. Master-planned by Professor Philip Cox, Melbourne Square is set to be a prominent gateway precinct inspired by the cultural heritage of the nearby arts precinct, the greenery of the surrounding parklands, Port Philip Bay and the orderly grandeur of city itself. Phase 1 is composed of three key elements: a folded landscape, a terrace podium and a pair of residential towers rising above. Spread across two full floors of both towers, with an expansive outdoor pool, park and dining spaces. The podium amenity provides a peaceful atmosphere for residents to enjoy at every hour. Melbourne Square hosts a premium collection of opulent eateries, full-line supermarket and an accredited childcare centre. Commanding magnificent views over the city, the executive amenity spaces on Level 54 deliver even more places to unwind in impeccable surrounds. From a series of private meeting and dining rooms to the premium lounge, gym, spa and pool spaces. Health and wellness is a key part of the Melbourne Square experience. The level 54 amenity podium are equipped with state-of-the-art exercise machines, weights, a yoga studio, massage rooms, pools, a sauna and spa. Curved corners, pleated walls and sculptural marble. There is a sense of bold artistry to the interior design or each Melbourne Square Residence, where every detail works in concert to create a home of contemporary luxury and ageless style. Master-planned by Professor Philip Cox, Melbourne Square is set to be a prominent gateway precincts inspired by the cultural heritage of the nearby arts precinct, the greenery of the surrounding parklands, Port Philip Bay and the orderly grandeur of city itself.